Here’s a picture of the drive end of Elsie’s old faithful 27K, which was made in 1900 and still resides in the ornate drawing room cabinet* in which it left the shop 112 years ago. Now, if you’re really into the old Singer stuff, I bet you got as far as “made in 1900” in that sentence and immediately said to yourself “Ahah! So it hasn’t got a boss for a handcrank!”. And if you did, I bow down before your awesome knowledge of such arcane stuff. If you didn’t, and you’re not entirely sure what a “boss” is in this context anyhow, look closely at the right-hand side of the column of this particular 27K, and hopefully you’ll be able to see that there isn’t the usual sticky-outy bit to which a hand crank or indeed a motor can be fitted. That’s the “boss”, or rather it would be if this machine had one. 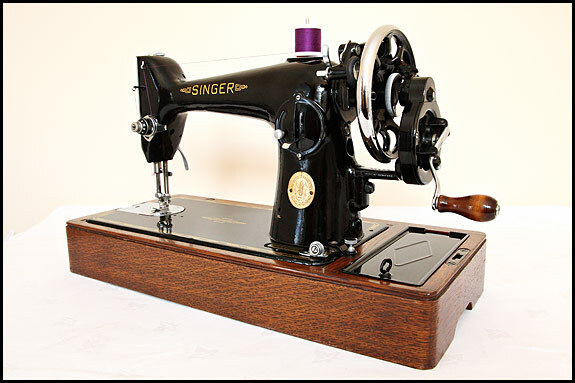 Later 27K’s do have one, but only a real vintage Singer geek could tell you when they changed from bossless to bossed. The best I can do is say that in 1900 at least some 27K’s didn’t have a boss but by 1903 they all did. Once you have your Hand Attachment 81712 to hand, as it were, it’s simply a case of undoing one screw and removing the belt guard from your early 27K, then fitting the handcrank by clamping its mounting bracket round the collar onto which the belt guard was originally fixed. It’s a job which requires nothing more than one ordinary screwdriver and five minutes of your time. The problem is of course that you first need to acquire your Part No. 81712. Which was only made for the very early 27K. And then apparently not in any great quantity. 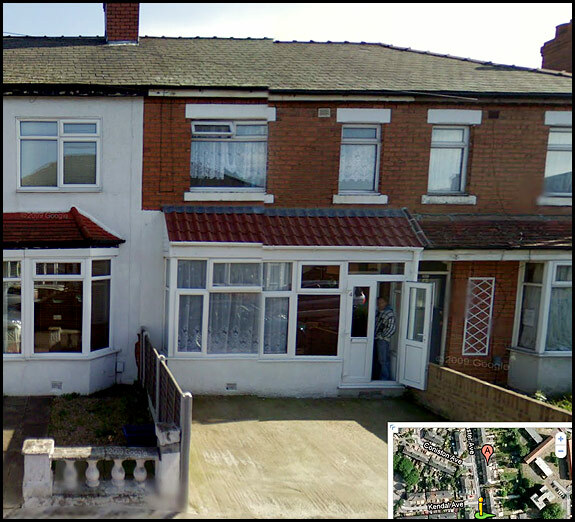 So they’re a bit thin on the ground. 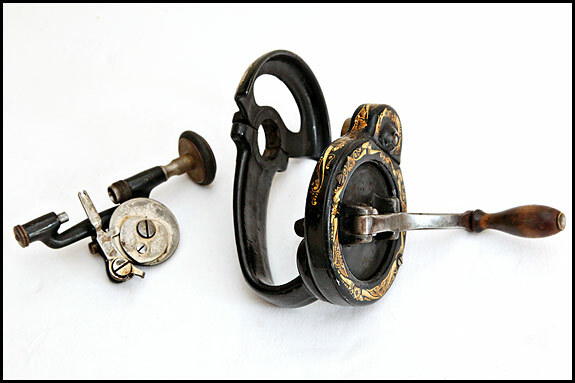 I’ve no idea how many of them Singer actually made, but I do know that the Hand Attachment had been officially declared obsolete by 1906, so it’s perhaps not surprising that 105 years later, most folk have never heard of it. Certainly this is the only one that Elsie and I have ever actually laid hands on. Given its rarity, it’s got to be a symptom of something or other that having completely forgotten we had this one, I found it yesterday under a pile of stuff alongside the dead printer which I’d finally decided to take down to the dump recycling centre. Be that as it may, given that Elsie’s 27K in the drawing room cabinet is in its original state and it’s such a delight to treadle, there’s actually more chance of me mastering the art of knitting than there is of us ever needing to use this particular bit of kit, therefore one complete Hand Attachment 81712 is now listed on our Bits ‘n’ Bobs page! * If you’re in the US of A, for “drawing room cabinet” read “parlor cabinet”. Edited 2nd October to add – thanks to Linda and Heather, I now know that Singer did indeed supply the 28K in a Drawing Room Cabinet! It’s a shame I didn’t think to take a few snaps of a machine we bought off Ebay last year from a bloke in Scotland. 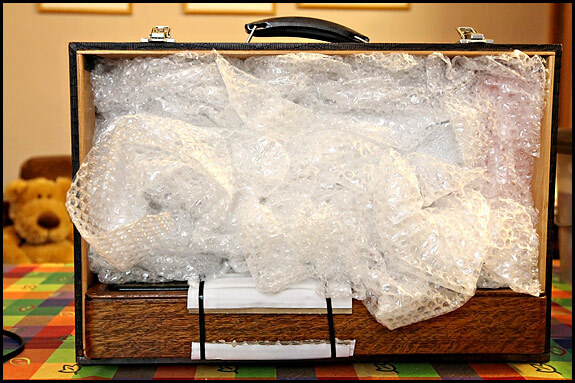 The seller assured me that he knew how to pack it, and what’s more had loads of bubble wrap, so it should get here safely and I needn’t worry. But of course it didn’t. 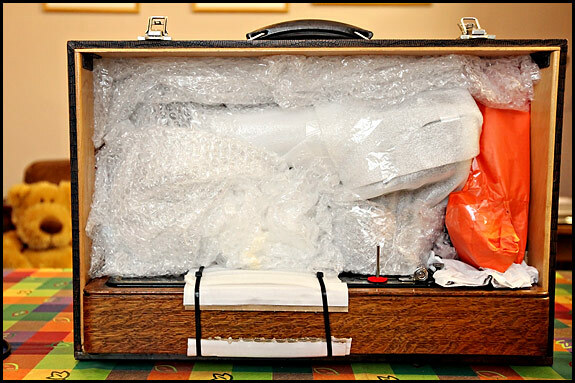 The short story is that he’d wrapped a few bits of bubble wrap round the column and the arm, popped it into the suitcase-type case, wrapped that with one thickness of bubbles then basically just wrapped a carton round it. And he was a bit mean with the parcel tape too. Here we see the start of the process. 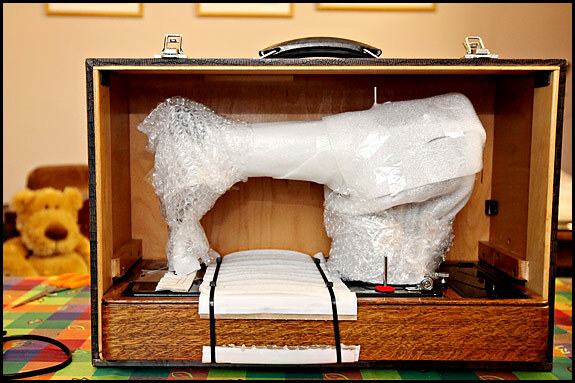 That’s a 201K MkI in that case and as you can see, Elsie’s started wrapping everything above the machine bed in bubble wrap and recycled plastic foam packing sheet. The bed is tied down to the wooden base with those heavy-duty black nylon cable ties, tightened down onto thick card packing so they don’t dig into and mark the woodwork. At the stage shown above, all the space behind the upper part of the machine is packed out tight with whatever we have available, be it secondhand bubblewrap, plastic foam, bits of expanded polystyrene sheet or even crumpled up brown paper. Anything, in fact, except polystyrene packing beans, which are no use whatsoever for this application. That orange on the right is the foot pedal and wiring, padded out then wrapped in several layers of packing tissue until it fits snugly between the column and the side of the case. Having got that in, we then lay the case on its back and check carefully that the machine doesn’t try to settle down if we push on it. If it does, we stuff more packing behind it until it doesn’t. And that’s about as much packing as we could get in before the bit which is a real faff. Once we get to this stage, Elsie spends ages trying the lid on, taking it off, putting a bit more packing in, trying the lid again and so on, until we’re as sure as we can be that nothing’s likely to move inside the case unless it hits the ground at a bad angle when dropped from a considerable height. Once the lid’s on, we can’t rely on the catches to keep it shut, so the case is tied shut with polypropylene binder twine going both ways round it. We then wrap the whole thing up with several layers of bubble wrap, a process which involves an enormous roll of bubble wrap and both of us on hands and knees on the kitchen floor. It must be quite entertaining to watch. After that comes a carton, and this is where the expanded polystyrene beans come into their own. The case sits in the carton on a couple of inches of beans, then the space all round and on top of the case is packed tight with beans before I get to play with the parcel tape gun. After that comes the addressing, and, for what little good it does, the ritual “FRAGILE” and “THIS WAY UP” marking in upper case with a fat felt tip marker. We’re not done yet, though. The last step is to get more binder twine and tie up the outer carton both ways, before crafting two thick twine hand holds on top of it. And before you start thinking how considerate it is of us to do that for the greater comfort of the poor blokes who will be handling this great weight, let me tell you it’s no such thing. It’s just another thing we can do to increase the odds on the carton remaining right way up for at least most of its time in transit. 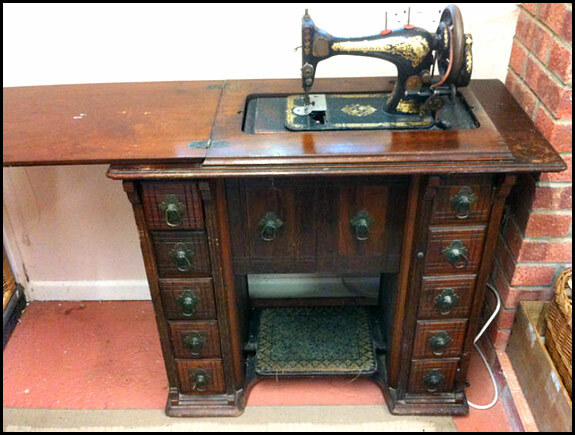 This is a machine I found earlier this year which now forms part of our little collection. 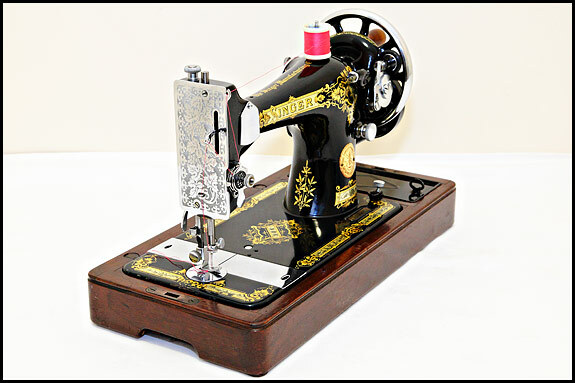 Elsie’s particularly fond of this one because not only is it really pretty and it sews beautifully now I’ve tickled its tappets, but it also came with the original sales receipts still in the Singer envelope. The lovely old tin full of attachments is original, as is everything else except for the can of oil, which is the right age and type but is actually Singer household oil rather than sewing machine oil. 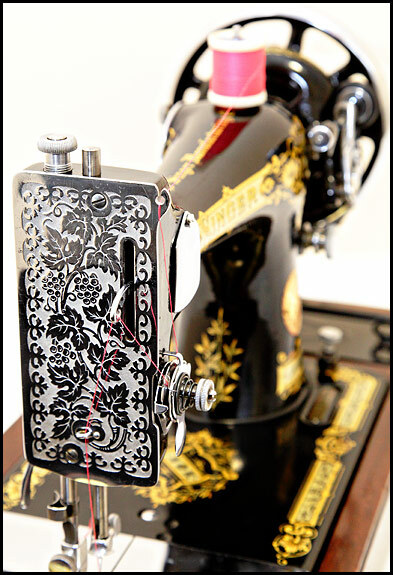 Check out the “Our own machines” page for more pictures of it. So, Mrs Fallshaw left the Singer shop in Barking with this on Christmas Eve 1938, and hopefully she didn’t have to carry it too far to the bus stop. She paid £5 15s 0d for her shiny new machine, which if the currency was decimal then would have been £5.75. What that equates to at today’s prices depends on which website you refer to, but as far as I can tell it’s something over £600. Definitely at least two weeks’ wages for Mr Fallshaw if he was getting the 1938 national average wage. 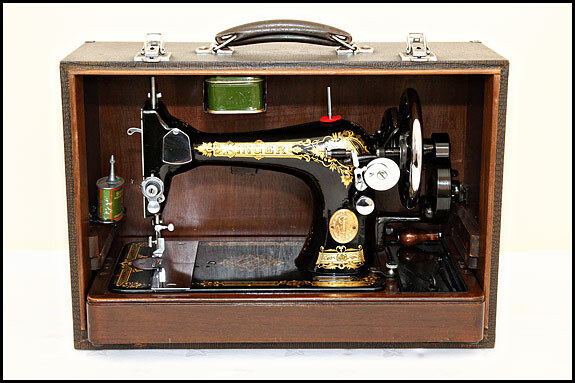 I suppose that before long our Mrs Fallshaw would have been running up the blackout curtains or blinds on this machine, and no doubt during the war years it would have done her proud for repairs and alterations. Maybe even dressmaking too, if she could get some material. 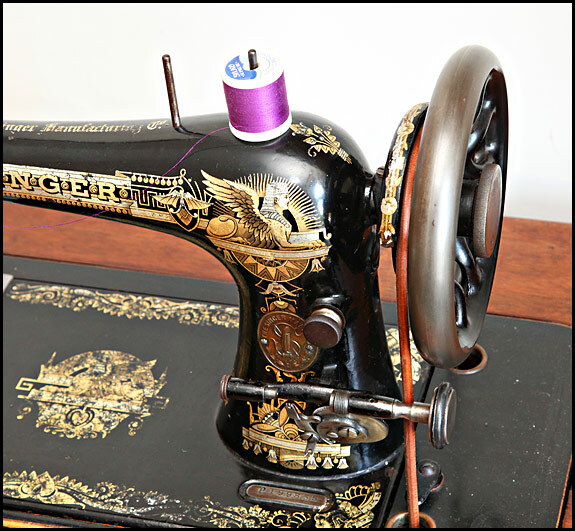 Wouldn’t it be fascinating to see what’s been sewn on this machine over the years? 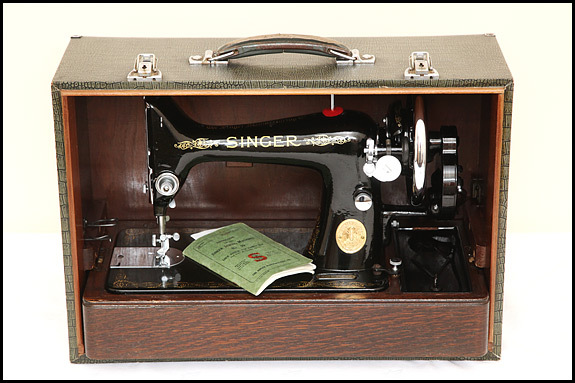 Just by way of an update for you, I’ve added another Model 99 portable to the “Singers for sale” page today. 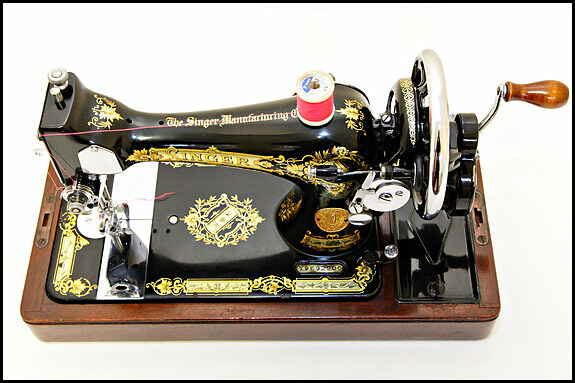 This one’s a late type electric portable, so if you’re after a Singer 99 we can now offer you a choice of hand-crank or electric! 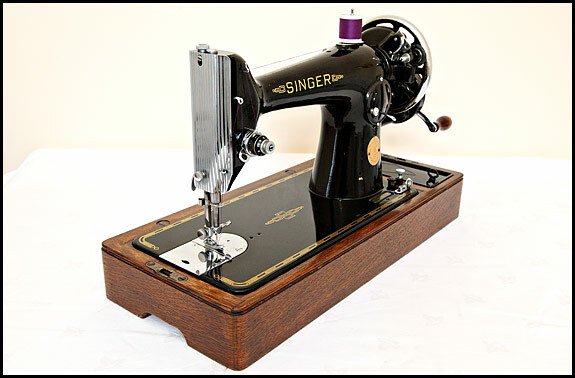 Also on the same page is a gorgeous hand-crank Singer 66 portable, complete with original bentwood case in very nice condition indeed.